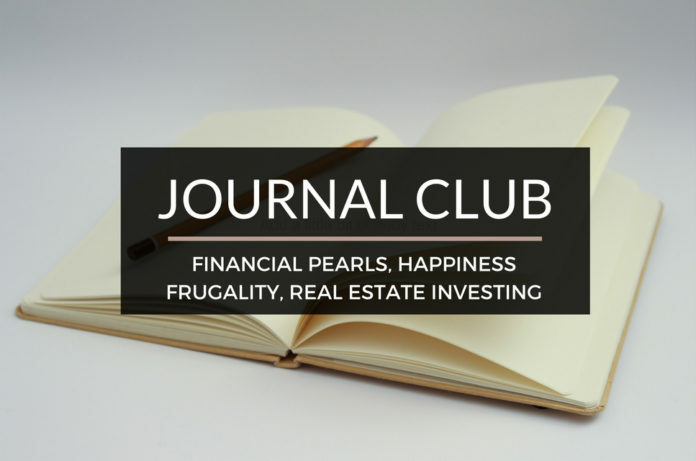 Journal Club 11-12-16 | Passive Income M.D. Sometimes a good list is all I’m looking for. The White Coat Investor gives 25 great financial tips to use as a launching pad for any physician at any stage of the game. My favorite is #15: Perhaps the best use of your money is to purchase your time. Read the list 25 Pearls About the Financial Life of Physicians. If you looked at my post from last week, I explored the concept of money and buying happiness. Another physician, The Happy Philosopher tackles the subject in How Understanding the Marginal Utility of Money Will Make You Happier. Look out for his 7-step summary at the end, it’s awesome. I think I’ll bookmark this one and review it a couple times a year. I’ve mentioned this before but frugality is definitely not my strong suit. Ultimately I believe it’s what’s keeping me from achieving financial freedom sooner. To compensate for my weakness, however, I’ve tried to work smarter to add additional income streams. That doesn’t mean I’m not trying to improve in this arena, and one way I’m trying to do this is by reading on the subject more often. Look at this article by Apathy Ends, The 7 Levels of Frugality – Find Your Sweet Spot. I relate to the Thoughtful Splurger, how about you? People always ask me how I learned what I know about real estate and where I get my info for continued learning. I’ve read plenty of amazing books but these days, the majority of the valuable content I gather is simply from blogs. This guest post on a the popular site 1500 Days to Freedom is packed with awesome info for anyone interested in income streams from real estate – The Best Real Estate Strategies for Early Retirement. I’d also like to announce this week’s Winners of the PIMD GIVEAWAY for a choice of one of my reviewed books! Thank you again to all our newsletter subscribers where these drawings happen every so often. I don’t actually ask for people’s real names, so here are the first 5 letters of your username. I will be emailing you of course. Congrats MFTSR, BEJIT, MIVER !!! To say this was a wild week in my life, everyone’s life, at work, and at home is an understatement. Half the folks reading this might be thrilled and the other heartbroken. In any case it was nice to end the week with Veteran’s day because this day (and of course Thanksgiving as well) always reminds me to live with much gratitude and to be thankful that I live in an amazing place whose freedoms are protected by amazing men and women in the armed forces. I have a few of those in my family and I couldn’t be more proud of their sacrifices. I know I talk quite about money, but ultimately the key to happiness is most likely living with a heart of gratitude. Also, with the election still fresh on the mind, I know you don’t literally vote for my site, but every time you visit or tell a friend/colleague about it and they visit, it’s a vote of sort letting me know that there’s value to be found here. And so far the support has been tremendous, so thank you everyone. Have a great week! As a physician, it may be difficult to find the time to search and manage good investments. While many physicians turn to the stock market and bonds out of convenience, real estate investments are just as simple to own. Through HomeUnion, you can truly invest in real estate passively. We provide all the services needed to remotely own residential investment properties in growing markets: from selecting properties, handling acquisition, maximizing income, performing management, and selling the asset. You Invest, We Do the Rest. I agree with you that gratitude is at the root of happiness.